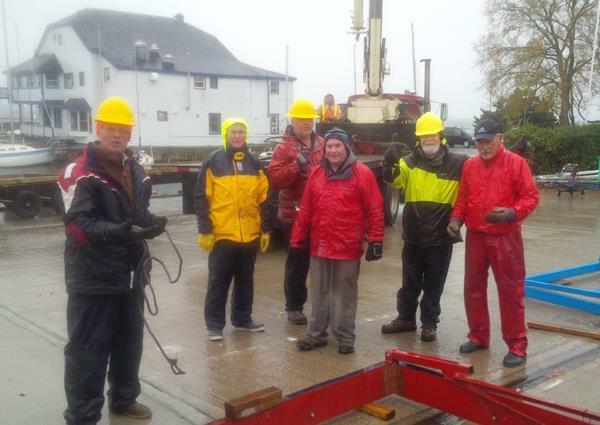 Golden souls braving high winds and stormy weather to place cradles in time for haulout! We are having our 1st Annual Halloween Party at KYC! And you are invited! The Spooky fun begins at 5:00! We will have arts and crafts, pumpkin carving, games and activities, some nibbles for the young ones and hearty chili for everyone else! We also will have a Haunted House for those who dare to go through! $5.00 p.p. please rsvp (or if you have any additional questions) with Greg McNab via the button below. The proposed winter storage plan with the order for masts and boats are below. Weather looks OK for Saturday,. not so good for Sunday, as it is forecast to be breezy. Brian, the crane operator will make the call on Sunday. Dont forget that breakfast is served 0800 Saturday and 0700 Sunday, volunteers eat free. I would also like to acknowledge the cradle crew, who this Wednesday morning endured a cold driving rain, and unloaded your cradles. They are: Brad Strawbridge, Andrew Kelm, Rob Colwell, Mike Charrette, Peter Cohrs, Ross Cameron, Darwin Muir, and Jim Beatson. Jim was supposed to retire-in-full, but the gravitational pull of unloading cradles and getting wet and cold at the same time proved too much to resist! Thanks again to the usual gang who do it year-in and year-out! A small number of member boats were found broken into on Sunday morning. Kingston Police were on-site to investigate and gather information. As soon as KYC was able to identify the boats involved the owners were contacted and informed. If you have any questions about this matter please contact the office. We are pleased to present the second of our winter dinner series. Chef Neil will be preparing an Italian-inspired four course menu with expertly paired wines from around Italy. Menu details will be available soon. Contact James to reserve your tickets at bar@kingstonyachtclub.ca There are less than 10 tickets left! Tickets are $50 per person. Don’t miss this unique dining experience at your club. Spicy sesame pork burger topped with house-made kimchi and pickled ginger. Beef burger topped with house-made onion rings, house-made ranch and provolone. Broadhead Brewing’s Radical Raspberry Wheat is our beer of the week, this is an amber wheat beer brewed with raspberries which give it a unique flavour and colour without making it sweet. Come and try one of these unique brews today, KYC is the only place in Kingston that it is available!